I have long since lost count of the number of great films I would never have seen if it was not for the Internet Archive. Yet another in the long line is Tol’able David, a coming of age story with biblical motifs. It is set in West Virginia (in a fictional village, I believe), presumably some time in the 19th Century, although I have not been able to pinpoint the date or even decade. Young David (a nice lad, but just “tol’able”, since he is not yet a man) grows up in a loving and pious family. They are tenant farmers, and they have a very good relationship with the neighbours, the Hatburns. David’s relationship is especially good with young Esther Hatburn. However, the happiness is about to be shattered. I do not want to spoil all the details of the evil that will befall David and his family, because I think the film benefits from watching it without knowing too much of the plot. 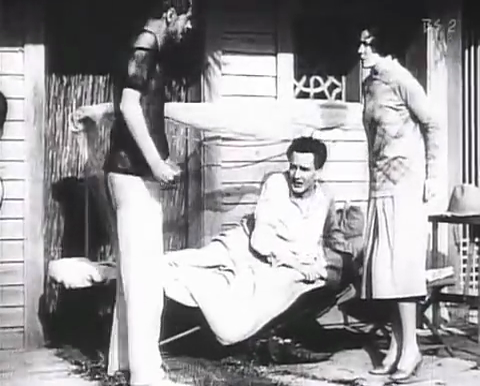 What I will say is that it is rare to find a film from the early 1920s that is so mature in its storytelling. Even though the ending is very Hollywoodesque, our hero’s road is uncommonly thorny, as his faith, love and courage are tested. This story is told to us by a number of really talented actors. Sure, they overact in typical silent style, but that is to be expected. They also show that they can be really subtle with their acting at times, as we feel their pain, joy, hate and love through the distance of time. Even though the age of nearly a hundred years can be felt, the film still has so many strengths that it is more than just watchable. The Internet Archive copy of Tol’able David, unfortunately, does not feature a soundtrack. This is a film that I feel would benefit tremendously from a good score, but even as it stands, it is a very fine specimen from a time when the art of cinematography was undergoing tremendous development. A few words deserve to be said about directory Henry King. When King directed Tol’able David, he had already been directing films for a few years, and he was to continue doing so for over 40 more years! At the Internet Archive, you can for instance find Lloyd’s of London (1936) and Hell Harbor (1930). While King may not have been a great artistic genius, he was definitely both talented and skillful. Tol’able David must have been one of his greatest achievements. This film is best enjoyed because it is a classic that truly deserves to be remembered and cherished. If you like silent film, you are going to love this one for its drama and fine character portraits. Victor Hugo’s The Hunchback of Notre Dame is one of those literary classics that have been filmed on a number of different occasions, infamously including an animated Disney version, proving that Disney can make light family entertainment out of practically anything. Out of the several Hunchback adaptations I have seen, two emerge as superior: the 1923 version with Lon Chaney and the 1939 version with Charles Laughton. The former appears to be the only version of The Hunchback of Notre Dame that is available at the Internet Archive. 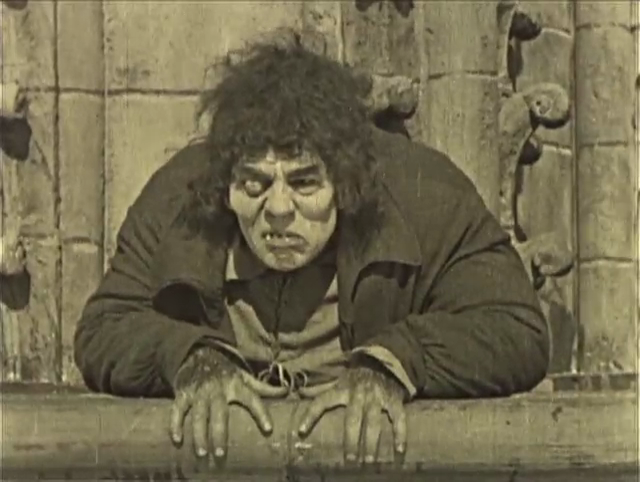 To cast the legendary Lon Chaney as the Hunchback was, of course, the best possible choice at the time. 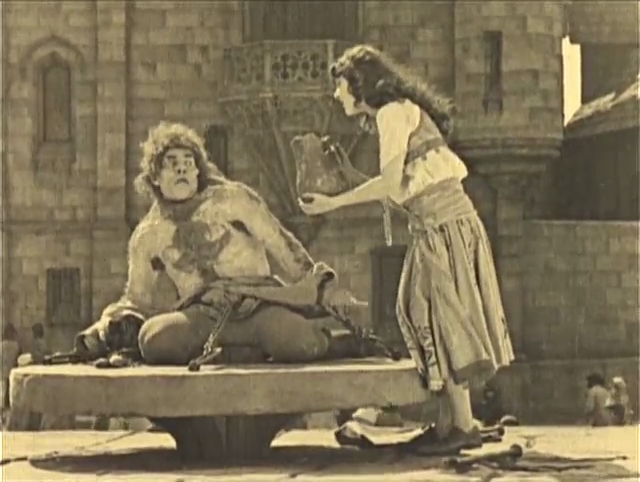 Chaney had already made several spectacular and impressive roles, for example The Penalty (1920), but The Hunchback of Notre Dame appears to have been the role that propelled him to the status of stardom, and thus on to future legendary roles. Unfortunately, I am less impressed with Ruth Miller as Esmeralda. So far I have never seen an actress that quite captured the youth and spirit of Esmeralda from the novel. Miller gives it her best, and that is adequate, but something is lacking. She is at least nearly the right age for the role (Esmeralda is 16 in the novel; Miller was only a couple of years older when the film was made), unlike several others; the worst example possibly being Salma Hayek who was over 30 when she portrayed Esmeralda. I am still waiting for the actress that can bring the combination of youth, naiveté, kind-heartedness and strength to the character. In addition to Chaney’s performance, there are several good reasons for watching this film. For one thing, it is perhaps one of the most truthful adaptations of the original novel (except for the inevitable happy Hollywood ending). The sets and costumes of mediaeval Paris are stunningly majestic and beautiful. Whether historically true or not, I am not competent to say, but they certainly help to set the mood. This film is best enjoyed if, like me, you are both a fan of Lon Chaney and of Victor Hugo’s wonderful novel. The combination of the two makes for a near-perfect film and a true classic. Eight men, one woman. They have formed a secret society, the aim of which is to better mankind by murdering those who deserve to die. They have gathered on this day to decide if a certain person will die, and if so, who is to perform the deed. Such is the beginning of The Ace of Hearts. The title indicates the fateful card that is used to randomly choose the murderer. But love is about to complicate our plot. Two members are rivals for the love of the only woman, Lilith, but she loves neither back. She only has feelings for the Cause. Ah, but what will happen when one of the two is chosen to commit a murder for that Cause? Can she separate her feelings for the man and the ideal? This plot may seem a bit corny, but works really well togehter with the excellent actors and the nice photography. Around this time, film cameras slowly started to move around; to pan, to track, to zoom. The camera in The Ace of Hearts, however, is always completely static. But that is not entirely a problem, because when the limits of the set are known, the director and cameraman can use the set as if it was a painting, carefully composing each detail to balance the whole picture. Akira Kurosawa was to use similar techniques a lot in many of his best films, decades later, and Wallace Worsley does it here, almost to perfection. Watch, for example, The Man Who Deserves to Die striding slowly from the restaurant entrance to the dining hall’s vault. Splendid! If you are a fan of Lon Chaney, The Man of a Thousand Faces, then this may or may not be a film to your taste. This is the only film I have seen where Chaney does not in any way use heavy makeup or prosthetics for enhancing his role and performance. Chaney is good enough an actor that he is excellent even without this, but if your fancy are his many amazing horror masks, then this film may disappoint you. Like any silent film, I am sure this one would have been even better with a good soundtrack. However, thanks to the film’s poetic imaging and slow but deliberate tempo, I did not find the lack of sound disturbing. The mere visuals keep tension up by themselves. If silence makes you nervous, a version with an acceptable organ score is also available, but unfortunately it has lower image quality. This film is best enjoyed as a conceptual sequel to The Penalty from the year before. The Ace of Hearts had the same director, the same star (Chaney), and was based on a novel by the same author, Gouverneur Morris. And even though the films are set in very different surroundings, they share the delving into the darker recesses of the human psyche. 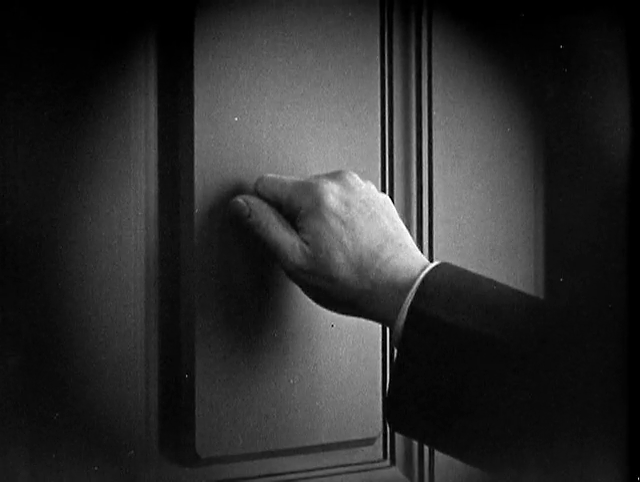 In the 1910s, for the most part, film as a storytelling medium was not yet very mature. Most films were static in their camerawork, and the scripts were often clumsy. Some slapstick comedy from that time can still be amusing (in moderate doses), but the dramas and “action” films of the day are mostly pretty tiresome affairs. But there are exceptions. Cabiria, even though it is the victim of many problems of its time, is one. This Italian film was one of the first great epic dramas, with spectacular sets, masses of extras and a bombastic storyline filled with hyperbole and melodrama. 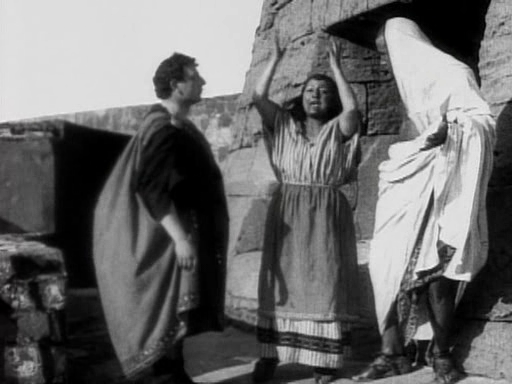 The film is about the girl Cabiria, who is robbed from her home during a volcanic eruption in ancient Roman times, taken as a slave to various places around the ancient world, and finally wins her freedom when she has become a grown woman. But in reality, various sub-plots are much more interesting, such as the story of Fulvio Axilla and his slave Maciste. Truth be told, the film is pretty confusing with all its characters and sub-plots, and sometimes too much, sometimes too little, information conveyed in the title cards. The poor girl Cabiria is barely even treated as a personality. In the first half of the film, she is dragged and carried around as if she was a thing. In the second half, we get to see a bit more of her as she has grown up, but even then she does not do much to give a lasting impression. Another character in this film is much more interesting, both due to the actor Bartolomeo Pagano and his portrayal of the character in the film, and due to the character’s later on-screen career. The character is called Maciste, and prior to watching this film, I had noticed that name, as it often appeared in Italian sword-and-sandal films from the early 1960s. 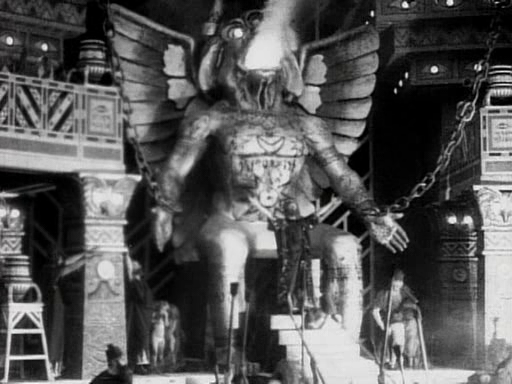 But the English-language dubs of those films often used other names, such as Atlas in the Land of the Cyclops (Maciste nella terra dei ciclopi) or Colossus and the Headhunters (Maciste contro i cacciatori di teste). I wondered about this sometimes: Who was this mysterious Maciste, who never got to keep his name in translation? Well, it turns out that Cabiria was his first appearance, and that he was later to star in 26(!) further silents (all with Pagano in the title role) and another 25 films in a revival in the early 1960s. I have not been able to find any other silents with Maciste at the Internet Archive, but there are several interesting 1960s Macistes. Perhaps I will review one of them in the future. The version of Cabiria I link to is the one at the Internet Archive with the best image quality, but unfortunately it has no soundtrack. If you feel that your life is incomplete without sound, then you can choose between a version with an electronic score and one with piano music. I personally prefer the latter in this case. This film is best enjoyed if you are interested in cinematic history. For its time, the film is an epic masterpiece, but I have to be frank and admit that it has aged quite considerably during the more than hundred years that have passed since it premiered. Do watch it, and enjoy what is to be enjoyed, but do not expect too much. It is still a great piece considering its age. Tomorrow, it was exactly one hundred years ago that the Russian October revolution started (Russia was using the Julian calendar at the time; hence the confusion about the specific month). That was the final stage of the Russian revolution, which led to the forming of the Soviet Union and, some forty years later, to the Cold War. And even though the Soviet Union has since been dismantled, it is no great exaggeration to say that those events still contribute to shaping the world into what it is. The most famous film about these events is Sergei Eisenstein’s October 1917, perhaps more commonly known as October: Ten Days that Shook the World, or in Russian Октябрь (Десять дней, которые потрясли мир). 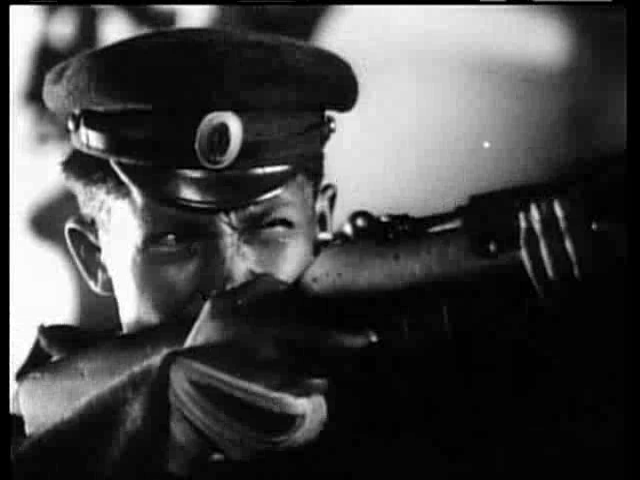 A great many of Sergein Eisenstein’s films are connected, one way or another, with the causes and effects of the Russian revolution. Strike (1925) and Battleship Potemkin (1925), for example, deal with events that in the official communist history writing are essential steps on the way to the forming of the Soviet Union, while films like The General Line (1929) detail the wonders that the revolution led to. October 1917 is the essence and the focal work of these two themes, as it deals directly with the revolution itself, and the events surrounding the Bolshevik uprising. I am sure that a historian would have much to say about the plot of the film. Like any other Soviet film dealing with history or communism in any way, the historic events have naturally been adapted to fit into the communist ideological perspective. The first Russian revolution, the February revolution (which, for the same reasons, was in March, Gregorian time), is briefly depicted, then the depravity and corruption during the next few months, as the new government turned out just as bad as the Tsarist regime. Then, after Lenin has convinced the Bolsheviks that action is necessary, the events during the night between October 25 and October 26 are told in some detail. We see how the cruiser Aurora moves up to the place where the cannons could be fired as a starting signal. We also see how the cossacks and the female Death Squadron are won over to the just cause, and many other key events. This film is best enjoyed for Eisenstein’s artistic and skillful telling of a story, whether historically accurate or not. His amazing cutting and use of imagery and metaphor must be experienced by anyone who has the least interest in cinematic history. 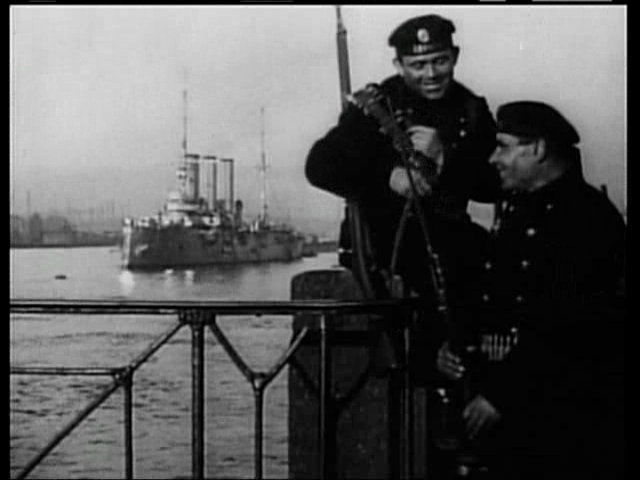 And though I would recommend Battleship Potemkin first if you want to watch just one Eisenstein film (especially considering how much better that Internet Archive copy is), October 1917 is should also be on your to-see list. There can be no doubt that Alfred Hitchcock was one of the most influential directors of all time. Many also hold that he was one of the greatest. His true greatness is most obvious in his many classic Hollywood productions from the 40s through the early 60s. (He also made a handful of films in the late 60s and 70s, but those are not among his best efforts). Before Hollywood, however, Hitchcock had already been directing films for 15 years! Those films, almost half of his total production, are often overlooked, in some cases for good reasons. Among those rarely seen early films is his very first attempt as a director (except one short and one unfinished film, both lost), The Pleasure Garden. Considering Hitchcock’s enormous influence, this is a film that should have a significant historic value, in spite of any cinematographic shortcomings. 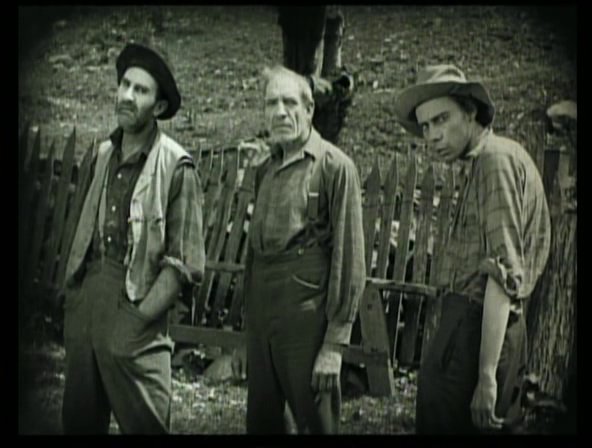 The plot is pretty standard fare for silents of the time. Jill has come to London to seek her fortune as a dancer. She meets Patsy, who works at a theatre called The Pleasure Garden. Patsy helps her get a job and lets her stay at her appartment, but later, when Jill has become a star, she will not return Patsy’s favours. The plot is complicated by two men. Hugh is Jill’s fiancé and Levet is attracted to Patsy. However, there is also an attraction between Patsy and Hugh. The copy at the Internet Archive is apparently some 15-20 minutes shorter than the original film (which has been restored in recent years). I have not seen the longer version, but I suspect that a longer film allows for some more depth to a story that in the present form is a bit hard to follow at times. This film is best enjoyed for its historical significance. Sure, you can see some interesting scenes that suggest the great things that were to come (especially in the beginning), but Hitchcock at this point is no better than several other contemporary directors, and the script is not really good enough to maintain interest all the way to the end. 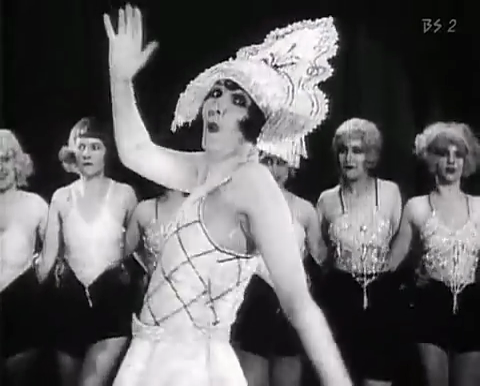 In my review of Ingeborg Holm (1913), I suggested that it is hard to find good feature film older than that, but during the early years of the 1910s, many good films were created that do not quite qualify as a “feature” by modern standards, yet are long enough to tell a reasonably complex story and helped to pave the way for future film makers. The Invaders is one of those films. The Invaders, which has been called “cinema’s first great Western epic”, starts with a peace treaty being signed by a U.S. colonel and a Sioux chief (both fictional, as far as I can tell). This gives the Indians the rights to their own land. The treaty, however, is soon broken. Some white people are killed by the Indians, and all of a sudden the war is in full swing. The film contains many great battle scenes, and though they were dwarfed by D.W. Griffith’s great epics a few years later, they are still very impressive for this time. Another important factor is the camerawork. Long distance unmoving camera was the norm at this time, and while that is common in this film as well, we see several scenes when the camera breaks free of its limitations, either panning or showing details in close-up. While not very spectacular today, it must have been effective for the audiences of the day. This film is best enjoyed not only because it is a good film for its time, but also because it treats the Indians in a much more respectful manner than many later Westerns, especially during the sound era. These Indians, evidently played by real Sioux, are actually portrayed as people, with humans rights and human feelings.